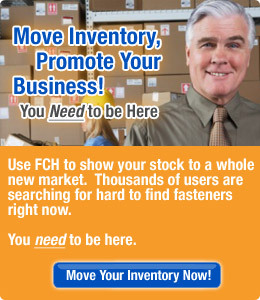 "FCH is a good source for hard to find items. You get a quick response back whether it's positive or negative." MO-KAN Fastener and Supply Co.
At The FCH Sourcing Network you will find hundreds of thousands of fasteners within our database of surplus, odd lot, slow-moving and hard to find fasteners that conform to the JIS specification. Bolts & Cap Screws by JIS Specification - Hex bolts and hex cap screws feature a large fastener head for distributing clamping load. These fasteners are used at high tensions and temperatures. Cap screws have a washer face underneath the head and are used in precise applications. Nuts by JIS Specification - Nuts, or mating fasteners, are available in hundreds of different shapes and sizes for any project or application. Varieties are normally hexagonal or square in shape, and have either coarse or fine internal threads that correspond to those of a mating bolt or screw. Screws by JIS Specification - Screws are one of the most versatile, useful types of fasteners, and are available in multiple sizes and styles. In different countries, and in different industries, there is some confusion in the distinction between screws and bolts. Some definitions of screws include the requirement that they be fully threaded, and these may also often be called Bolts.